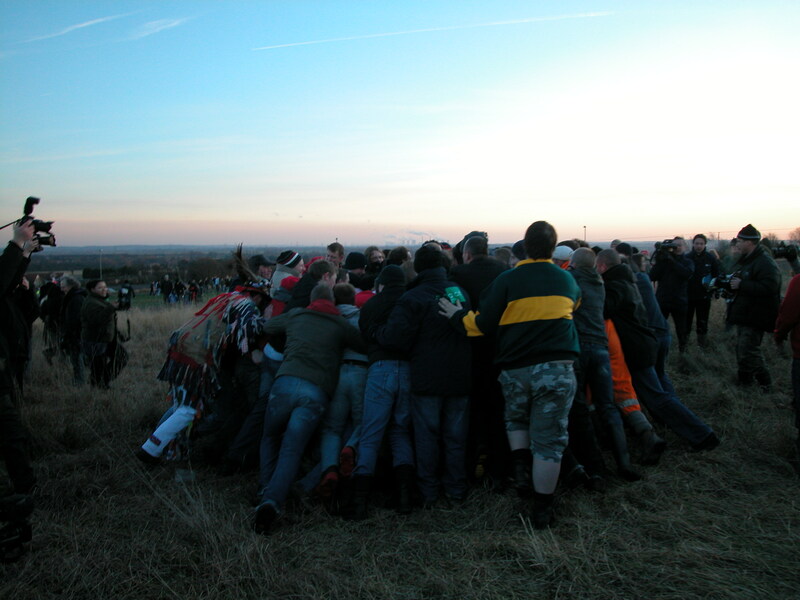 The Derby Tup or Owd Tup of all the traditions that are to be found along the eastern midlands is the most enigmatic and fascinating. This is interesting for two reasons. One because it is close to the village visited in Russell’s 1974 Derby Tup film and his Survey of traditional Drama in North–east Derbyshire 1970-78 and secondly, because it overlaps with the Harthill Morris revival which begun in 1974. Furthermore, the local school continue the tradition and indeed may have since the 1970s. 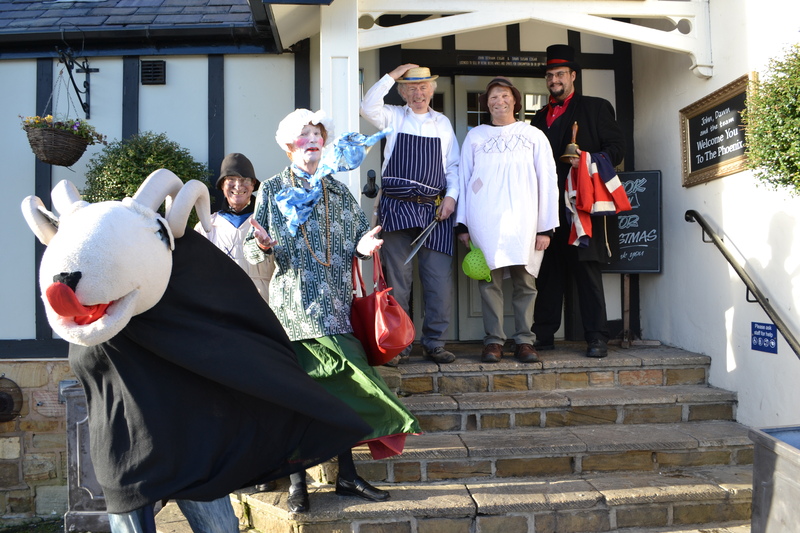 The Tup play differed according to the village and each village had a different type. A competitive element was introduced when groups of young boys would vie to be the first group in a certain pub to give a rendition and obviously earn the biggest pot. According to Derreck another forum member, who relates that this rivalry ended up in fighting. ‘Here comes me an’ ar owd lass, Short o’ money an’ short o’ brass: Pay for a pint and let us sup, Then we’ll act the Derby ‘Tup’. “As I was going to Derby, Upon a market day, I met the finest ram, sir, That ever was fed on hay. (Chorus repeated after every verse) Faily, faily, ready for haily day! This ram was fat behind, sir, This ram was fat before, This ram was three yards high, sir, Indeed he was, or more! The wool upon his back, sir, Reached up to the sky, The eagles built their nests there, For I heard the young ‘uns cry. The wool upon his tail, sir, Was three yards and an ell, Of it they made a rope, sir, To pull the parish bell. The space between his horns, sir, Was as far as a man could reach, And there they built a pulpit, But no man in it preached. This ram had four legs to walk on, This ram had four legs to stand, And every leg he had, sir, Stood on an acre of land. “The man that killed the ram, sir, Was up to his knees in blood, And the lad that held the pail, sir, Was carried away by the flood. Indeed, sir, it’s the truth, sir, For I never was taught to lie,And if you go to Derby, You may eat a piece of the pie. At which point a collection is made. Many of the older Tups were simple structures made from a broom or even a turnip. In Worksop it was common to use a preserved head – a rather gruesome but effective device. Some had moving jars and illuminated eyes. That of the Harthill Tuppers is the latter, a substantial beast covered in wool with glowing ball eyes, an articulated mouth and a very impressive flapping and rolling tongue. I planned to see the Tuppers at the Phoenix Inn, Ridgeway. After eating a rather fine meal there, I nearly missed the team as they Introducer came bursting in with his bell, fast behind him came the characters-the Farmer, Old Sal, the fool, the butcher and of course the TupCo-incidentally it is to Ridgeway that Ian Russell in his 1974 documentary on the Derby Tup of which more in a moment. Some folklorists suggest that the theme of the story is pre-Christian in origin. It is easy to read into pagan motifs into the story. The enactment around the summer solstice and new year emphasising this even more. Of course the ram image is a very significant figure. The Devil is always portrayed as goat like, but this is a personification of a pagan god. By killing him as the year ends, perhaps his blood is said to fertilise the land and encourage farm beasts to breed, as a sacrifice. Indeed, evidence for its greater significance was given as the Tup left to be put in the car, a local lady said is this the Tup upon giving it a touch for good luck. It was interesting to see some traditions die hard! 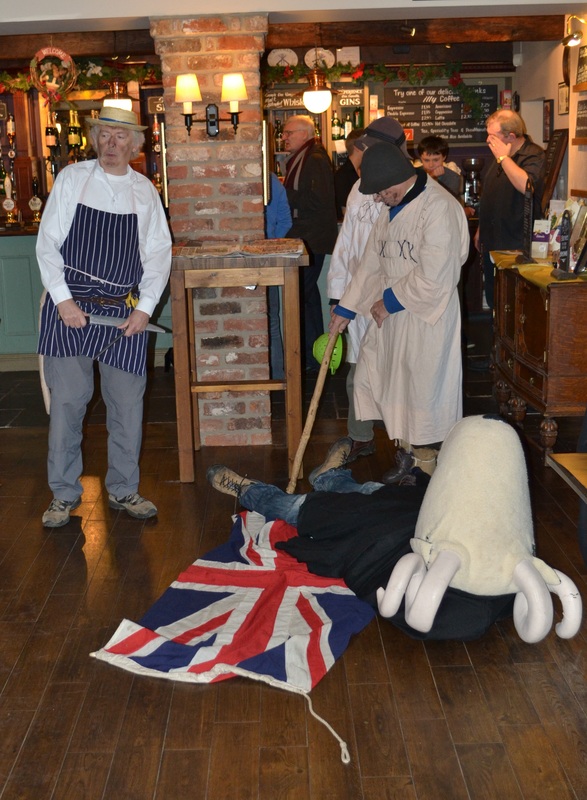 Firstly, what is worth noting that in a scene in a pub, the death of the animal is greeted with boos! The early 70s was a period linked with greater awareness of such issues and as such younger people would have been less inclined to be involved in such a bloody thirsty custom. Interestingly, I think we’ve gone through the period of time which would seem ‘ritual slaughter’ offensive and now again children would enjoy this. A number of children watching the Tup with me were thoroughly enthralled. We cannot discount apathy. Children today have many other enjoyments and this is evident in the film that many Tuppers may have been going through the motions. The first team shows this by the group of teenagers either not wanted to be filmed or not wanted to do it. However, the other scenes show more enthusiasm. Of course this lack of involvement combines with three other factors. One being increased affluence. Now that is a good thing of course, but children are less likely to find ways to raise their own money if they don’t need to. This combined with ‘Danger-Stranger’ probably sealed the fate of the original run of the custom – many people could not imagine their young children travelling around pubs to collect money and be concerned, rightly so, for their safety. The final important factor is society’s immunisation to begging. Collecting money for one self this way is frowned upon. I long to hear a Morris team or old custom which collects for itself rather than charity! As the prevailing culture was to collect for a worthy cause, other than themselves, this would be a factor to discourage the Tuppers. This is perhaps combined with ‘Charity lives at home’ attitude. All these appear to have sadly caused the demise of the Derby or Owd Tup tradition as enacted by children, but fortunately this team excellent and energetically uphold the tradition and long may they continue. However one could not help feel that this was a dying tradition – and even from the words of one the main protagonists – they were not always welcome! Was it raining? It appeared that a month’s rain fell on Kimberley that evening as I made myself to an obscure pub in an out of the way part of the town. It was heavy..cold rain which gets in through your coat, under your skin, chills you…what did I expect it was the week before Christmas and there I stood in watching for the arrival of the Owd Oss…in a small typical suburban pub. Perhaps not the most likely one to see an old custom, but with it’s no nonsense decrepit decor, seats with the leather torn exposing their stuffing and mock Tudor woodwork, perhaps the most evocative. Arriving there early, I enquired if I had arrived at the correct place..yes they said they’ll arrive a little later and asked if I’d like a drink. I did a tea please….it was all I could have to warm me and for once a large mug was produced without any form of tutting or eye rolling! 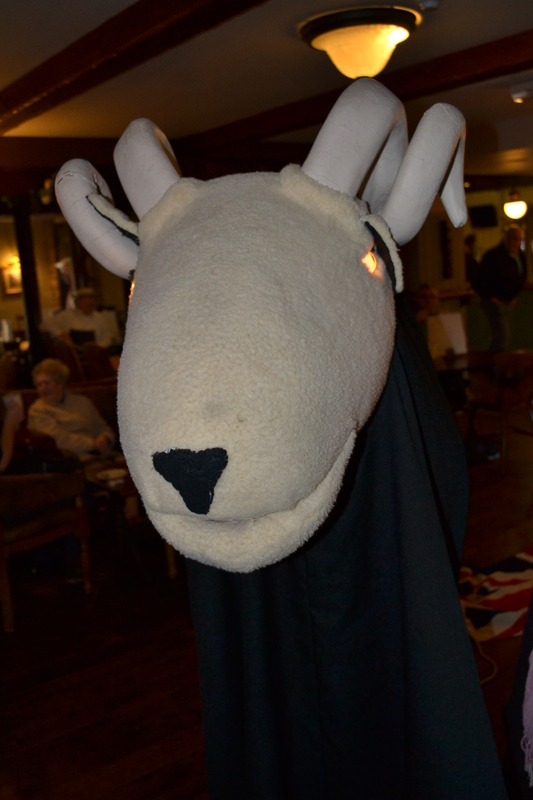 It was clearly a local’s pub, although unlike some local ones, it was in no way intimidating, but I did wonder what they would think when the Owd Oss would appear. Then through the rain appeared the team…running to avoid the wet from their car!! Poor Owd Oss distribution was a north Midlands – Yorkshire one, with the longest continued tradition appearing to be in the 1970s in Dore on the outskirts of Sheffield. It appears to have been common in Nottinghamshire, particularly in Mansfield in the 1870s, but played until 1914, although as noted there is record in 1921 for the children of the village at school party. The local newspaper Mansfield Chad recorded a revival in 1984, but this appears to be a one off. Nothing appears recorded of the custom in the midlands for over 20 years. 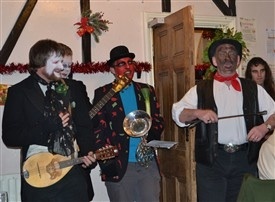 Then Dave Mooney, member of the Black Pig Morris and one of the Oss’s musicians apparently had the idea to revive it reading a book on folklore and customs in bed once, which noted that the Poor Owd Oss was enacted in Kimberley written by Mason (1902). He at the time was the member of a local Morris team and thought he would do some research. Lo and behold he found a script that was done in Kimberley and so getting a small group of musical friends together resurrected it in 2005. At first the Oss consisted of a papier-mâché skull, then one made of railway sleepers and finally a real horse’s skull. This skull is painted red, has LED eyes and other lights. Unlike the first skull this structure does not open and close its jaw – which is a shame. All skulls are attached to a pole and carried by a man cloaked and wearing a silver death mask. The reviver of this custom was Dave Mooney who informed me that he came across the custom whilst idly reading a book on traditions in bed! That year, after the discovery of the above script recorded by Mason in 1902 and information that is was done in Kimberley, with some musician friends and Morris men revived it. They custom is only undertaken one night, usually the week before Christmas and involves visiting local pubs usually three or four a night, including in Ilkeston in Derbyshire and mainly Kimberley in Nottinghamshire. Perhaps the Poor Owd Oss is a survival of this Winter solstice observation with this custom being a continuation of a form of pagan animal worship. However, it could have equally arisen in the Industrial period as a response with something to do with the skulls of pit ponies to raise some money! “His coat it was once of the linsey-woolsey fine, His mane it grew at length, and his body it did shine, His pretty little shoulders that were so plump and round, They’re both worn out and aged; I’m afraid he is not sound; Poor old horse! Poor old horse! His keep it was once of the best of corn and hay, That ever grew in cornfields, or in the meadows gay; But now into the open fields he is obliged to go, To stand all sorts of weather, either rain, or frost, or snow; Poor old horse! Poor old horse! Then the team got themselves together and off to the next pub. Here there was a bigger crowd and some of them happily joined in with the verses. Then after their third pub…it was into the night, back to the stable for another year. What I enjoyed about this revival was it was done for the right reasons, for the need to continue something unique to the area. Richmond, Yorkshire has similarly revived theirs, but with its attendance to proper pubs and working men’s locations, there is something earthier and working class about this revival and more in keeping with its origins I feel. The Poor Owd Oss is a Nottinghamshire – Derbyshire tradition and it is great to see that local people recognise this. The Owd Oss is done because it should be done and long may it continue quietly to be enjoyed in the obscure areas of Nottinghamshire. Folk plays are a fascinating pieces of traditional custom and one which is surviving well in the 21st century. One particular strand of this tradition is the Cheshire Souling or Soulcakers. Presently, there are a number of groups which enact this strange ritual usually from 1st November (All Souls Eve) until the 4th November in pubs, inns, houses and sometimes churches in the Cheshire and Lancashire region. Although the Antrobus Soulers may disagree, all of the groups are revivals (this means there has been a break in the last 100 years). The second oldest revival group is that which tour with the Warburton Play. I decided to track them down in the picturesque town of Knutsford, I had read of their website, a very informative site where I found some of the information for the blog, which gave the name of the first pub in the town. I turned up and enquired behind the bar “Are the Soulcakers arriving tonight”. The “What?” said the manager; she appeared to be blissfully unaware. They planned to do a quiz at 8 when the group arrived. However, her younger colleague did seem to know what I was on about, so 50% was good enough for me! I sat down with my drink and some free sandwiches. Later a couple arrived and the manager pointed over to me, at least this was some support for the fact I had arrived at the correct destination. What is a Souling Play? Souling in the strictest form is a custom associated with the souls of the dead’s journey through Purgatory. This would involve the collection of money or the giving of cakes, soul cakes, hence the name soulcakers. To eat such soulcakes would then involve the eating of the sins of those unable to get to heaven. Of course you may ask “but that means the consumer gets the sins!” Yes, but by continuing the tradition ad infinitum there would always be someone eating sins for those just departed. Of course as the custom faded to be replaced largely by Hallowe’en’s trick or treaters, those who were the last to buy the soulcakers must have never left purgatory so heavy the burden of the sins they inherited!! You may of course look scornfully at the custom but this is the origin of the funeral wake. What’s this got to do with a play? Good point. It appears at some point to warrant the giving of money or cakes, some bright spark either the receiver or giver thought they wanted something a bit more substantial and so the play was probably born. This may account for the similarity to the Christmas Mummer’s Play, because it’s easier to convert something to write from scratch. Indeed, to the uninitiated there does not appear to be much difference between the Soulers and the Plough Monday play. Indeed, both share a similar plot, both being about death and revival, and share in some cases the same characters: the quack doctor, Beelzebub, and the familiar drag-act, so to speak. However, there are differences, the Sergeant is replaced by King George, the Tom Fool replaced by the Turk and there’s a decent bit of sword play in it…and there’s the Horse. The horse is a unique feature of the Soulers and one which has created the most interest amongst folklorists. In the present guise, the horse is an old hunt horse befitting its trainer in hunting pink and treated with upmost almost quasi-religious respect, it being hidden from view when not in the play almost as if this might detract from its powers. 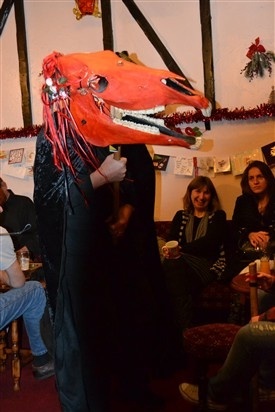 Perhaps the horse survives in Cheshire plays because of the proximity of the Welsh boarders with their Mari Lwyd horse tradition existed (or vice versa), although of course there are the Poor Old Oss traditions and to some extent Derby Tup traditions surrounding it to the east. Many folklorists have commented that the Horse was an important figure in Celtic paganism, which is significant being that All Souls Day replaced the ancient Samhain. Certainly the horse is no Hobby Horse, but a dark rather sinister creature, a skull on a stick with a black cape beneath hiding is manipulator. In response to key phrases, its mouth opens and closes with a menacing clap! 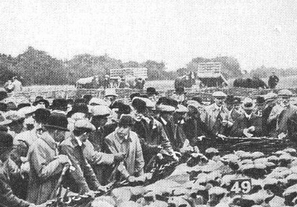 It is interesting to note that there is record in the 1930s that the Warburton horse was buried in the grounds of the pub at the end of the performance. This is referenced once it appears and perhaps this was a ceremonial aspect, rather than an end point, emphasizing the death and resurrection aspect again. Around 8, these plays never seen to be on time, we heard the rowdy chorus of the soulers and soon after in bursts Big Head, much to the amazed and giggled bewilderment of the table nearest the door. The plot was as follows…in comes the Turk who does a bit of boasting, to be challenged by King George, there a fight, Turk dies, in comes his mum (that old standard a bit of drag), calls for the doctor who revives in, in comes Beelzebub who steals a drink from those bewildered beer drinkers and the Horse with its rider. There may have been many different local variants of the play perhaps every village had one, but as the 19th century came to close the numbers began to dwindle, the final nail in the coffin being the First and Second World Wars. Indeed the Warburton play was last performed in 1936. However, after only a gap of 42 years, it was revived, thanks to being written down before its demise. 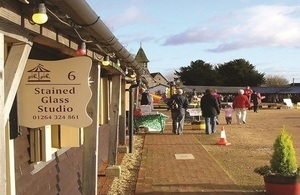 The revived play centres around the Saracens Head in Warburton where the play is performed for the first time that year and then after 4 days ends there. A group called the Bollin Morris revived the play in 1978 and continued to be the preserve of this group until the 1990s, when the group became a mixture of Morris and non-Morris, and then finally in the 2000s the group began unconnected with Bollin Morris. The establishment of set characters for each member of the group appears to have introduced a degree of professionalism and the play was delivered word perfect and with great vigour and enthusiasm despite in some cases the paucity of punters. I was impressed by the fact they took notes and appeared to be organised to get the best performance each time like a real play and this was not some amateur effort. So if you find yourself next year around Cheshire, I suggest following the Warburton play, it will be enjoyable evening.